Elizabeth is outgoing and people are immediately drawn to her and feel comfortable. Guaranteed when you meet her you’ll be greeted with her 12 years of experience and a smile. By the time you leave, you’ll know all about “Southern Hospitality”. She Strives for perfection and is determined to outdo herself each and every time. Her goal is for your hair to not only looks awesome when you leave, but for you to maintain your style for 4 to 8 weeks through personalizing your precision cuts and Sassoon blowouts. By doing it right from the start, you will have a look that is easily maintained at home. 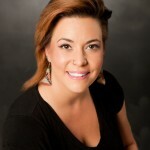 Elizabeth is a Master Stylist & Paul Mitchell Signature Salon Artist, color expert & formal hairstyling specialist. She offers texture services, waxing, eyelash applications, sunless tans & express facials. Elizabeth is Color Certified by Paul Mitchell, Redken, Goldwell. L’Oreal Professional. Texture certified by Paul Mitchell, Marcia Teixeira, Simply Smooth & Mizzani. Elizabeth has completed an assortment of product knowledge courses. She serves diverse clientele with all hair types and textures. As far as her personal style “Timeless” sums it up.